1. Prepare enough blank index cards for each student to receive one card. If you do not have index cards, you can cut a blank sheet of paper into four squares to make cards. 2. Pull up the Video: "What Could Go Wrong?" 3. Print out enough copies of Handout 2: Adult Interview for each student to receive one copy. Video: "What Could Go Wrong?" 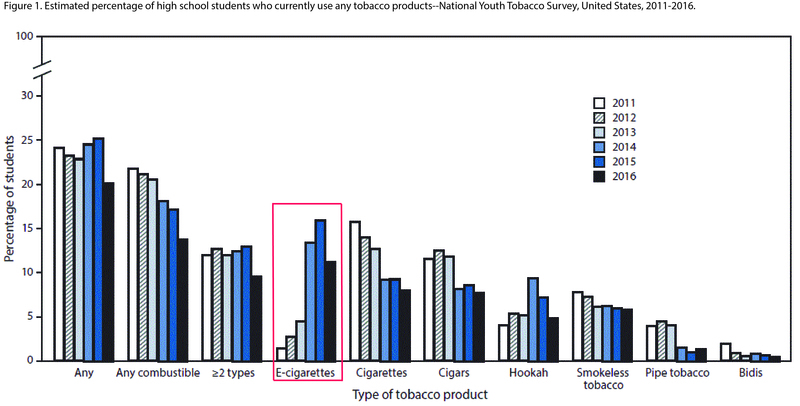 CDC's "E-cigarette Ads and Youth"
Identify the percentage of E-cigarette users in high school and middle school and describe nonsmokers as the majority. Discover the amount of money the tobacco and E-cigarette industry spends on advertising its products. Recognize the covert methods that the tobacco and E-cigarette industry uses to attract new E-cigarette users. Analyze some of the propaganda techniques tobacco and E-cigarette companies use to sell their brand of E-cigarette. Identify reasons why teens may begin using E-cigarettes. Identify positive alternatives to using E-cigarettes. Show Video: "What Could Go Wrong?" and briefly discuss impression with class. Ask students to guess the following on scratch paper: What percentage of middle schoolers smoke E-cigarettes? What percentage of high schoolers smoke E-cigarettes? Ask students to share their guesses. Reveal the actual numbers: As of 2018, only 11.7% of high-schoolers and 3.3% of middle schoolers have smoked an E-cigarette in the last 30 days. Explain: Advertisers think you are easily influenced by what others do, so they try to make it seem like everyone smokes. In reality, only a very small percentage of teens use E-cigarettes. Discuss (5-10 min.) the homework (Handout 1: "Where Do You Stand?") from the previous session. Distribute an index card or paper square to each student. Ask students to take 1-2 minutes to jot down what defines them as a person and their goals. These could be short-term goals or long-term goals. Ask students to flip the index card over and record their answer to the following question: How would addiction affect your current identity or goals that you have made for yourself? Ask students to share their responses. Remind students that E-cigarette companies want you to become addicted to their products so they can make money. Distribute an index card or cut up paper square to each student. Ask students to independently record responses to the following question on the front side of their index card: Why might young people experiment with E-cigarettes? On the back side, record responses to the following question: What are some positive things young people can do instead of using E-cigarettes? Collect the index cards and read responses aloud to the class. Make a list of the responses on the board. Assign Handout 2: Adult Interview to be completed before the next class. Emphasize that students should interview one of their parents or guardians, but if they cannot arrange that, they should find another adult to interview.